Having built hun­dreds of web­sites for busi­nesses ranging from first-time sole traders around Cardiff and Bristol to large national organ­isa­tions, I know what web design factors really help them succeed. Few web designers will admit this, but whilst visual design does matter a lot, “pretty” isn’t auto­mat­ically prof­itable. That’s why I also provide SEO, Social Media Mar­keting and other digital mar­keting ser­vices. I also offer things like bespoke web devel­opment, for when you need to go beyond the limits of popular systems like Word­Press. Most of these truly business-building ser­vices aren’t very visual. So, a simple web design port­folio of screen­shots wouldn’t really tell you much. So, I’ve added some notes below to provide more inform­ation on what I’ve actually provided for each client — I hope they help. With sur­geries in Cardiff and Newport, South Wales, top inter­na­tional vas­cular surgeon Mr. David Lewis needed an editable bro­chure website to rep­resent his practice online in a pro­fes­sional yet striking manner. The site also lets him add inform­ation pages for his patients, out­lining the many con­di­tions and treat­ments he deals with. Leading UK cos­metic nurse Julie Brack­enbury knows the value of great website content — and creates a lot of it herself. Still, with estab­lished clinics in Bristol, Bath, Chel­tenham and Malmesbury, setting up South Wales branches proved time-con­suming. So my Content Mar­keting ser­vices kept her site sup­plied with fresh, engaging art­icles, under her dir­ection. 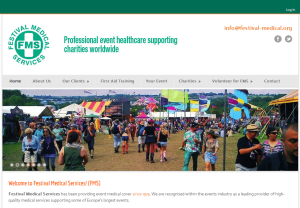 FMS provides medical ser­vices for major UK fest­ivals, including Gla­stonbury and Reading. They needed bespoke web apps for patient triage, event planning, mem­bership and team man­agement. These had to be cost-effective, flexible, secure enough to manage thou­sands of volun­teers — and integ­rated with a full-fea­tured, editable website. EQ Dis­covery Ltd. provides spe­cialist UAV (drone) video ser­vices for envir­on­mental and indus­trial mon­it­oring pur­poses as well as pro­mo­tional aerial videos for mar­keting venues and events. Their editable website helps to promote these varied ser­vices, with lots of flex­ib­ility to add videos, image gal­leries and other fea­tures. Exper­i­enced yoga teacher Sue Baynham-Evans wanted an editable website with a fresh, sunny design. This lets her update and promote her yoga classes and courses in Caerleon, Newport and sur­rounding areas. A port­folio site for fantasy and wildlife artist Helen Frost Rich. Helen wanted a simple design that reflected her inspir­a­tions — the eth­ereal aurora, birds and other creatures of the air. Her site also includes e-com­merce, integ­rated with two print-on-demand systems — one to let vis­itors buy her art as high-quality prints and another offering it printed on t-shirts and similar mer­chandise. Withy­combe Fair has been sup­plying fine arti­ficial flowers and faux plants for wed­dings, films, theatres, con­fer­ences and other special events since 1989. 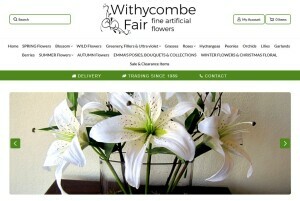 Their online shop offers a huge range of silk blooms and bou­quets. Still, growing com­pet­ition from less spe­cialist stores has under­mined their search pos­i­tioning, so my flexible SEO plans are helping to restore that. Tim is a popular British artist based in Germany. His port­folio site includes a huge gallery of vibrant pop art, CD covers and murals. Ori­ginally com­posed of hun­dreds of static pages, this is now an editable site that Tim can maintain himself. A gallery and online journal for award-winning wildlife artist Mo Rich. Strong colours com­plement those of her natural sub­jects, with a simple trim to keep vis­itors focused on her stunning artwork. An online port­folio and shop for mask maker and fantasy artist Helen Rich. Clean lines com­plement Helen’s diverse work, whilst moonlit hues reflect her gothic influ­ences. Helen can easily add content to her gallery and announce new pro­jects on her blog. Natur Cymru has been estab­lished as the premier nature magazine for Wales since 1955. Its online archive of past issues has suffered from cuts to public funding in recent years. Despite a great appeal from popular nat­ur­alist Iolo Wil­liams in 2017, it still needs to develop new revenue sources and a stronger online presence, so I’m helping out. Please link to Natur Cymru, or share it with your friends — you’d be sur­prised how much that matters. The UK’s top pet rescue com­munity needed a huge, bespoke dynamic site with bespoke admin systems. I helped them grow to over 100,000 members, 100,000 pets and 2 million monthly page views. Now reuniting two-thirds of lost pets with their owners, the site has won several awards including the IFAW Innov­ation Award. Based in Bristol, Blue Rosey Homecare Ltd. provides pro­fes­sional care ser­vices for those who need help with inde­pendent living. Their editable website intro­duces these ser­vices, and lets them update the site with news, jobs and other inform­ation as it becomes available. The Bathroom Marquee provides wall panels and flooring for bath­rooms and kit­chens. They needed help with SEO and social media mar­keting to combat a slump in site traffic. A com­bin­ation of on-site updates and managed social media ser­vices soon had them back on Google’s first page for dozens of their target keywords, with over 10% traffic growth within six months. A2B Audio Visual Ltd. provides and installs a wide range of audio visual equipment throughout South Wales and the South West to both com­mercial and domestic cus­tomers. As a Which? Trusted Trader keen to expand, they needed an effective SEO strategy to help them build a stronger profile in search engines. 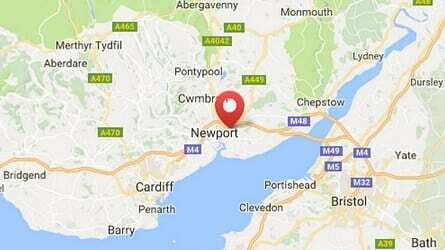 Newport’s oldest family-run bed shop stocks thou­sands of beds, mat­tresses and other home fur­nishings. They needed a full-fea­tured, modern e-com­merce site to manage this. Do you need a new website? Or help with your existing one?